Peter Martin, originally from Dublin, Ireland, now lives in France with his French wife and their three children: two daughters, 7 and 5, and a son, 2. The children are being raised in French and English. Peter runs his own business, Globeclic, which designs and localizes websites and pursues other digital projects for international markets. Like other parents raising bilingual children, I want to expose my kids to the culture of the minority language as much as possible. So when the opportunity arose to travel back to Ireland for ten days this summer to see family and friends, I was quite excited. I know France and Ireland aren’t exactly a million miles apart, but it’s not so easy to get back there, even for a brief stay, when I have to find a time that’s good for everyone and juggle job commitments on top of that. Since my first daughter was born, seven years ago, I’ve been experiencing the immense joy and privilege of living life as a bilingual family. It hasn’t been easy, though. Because, selfishly, I had to learn French to help me find employment, just when my daughter was born, I had to use both languages and she was conscious of the fact that Daddy was gaining ability in the majority language, too. But it’s encouraging to see that, with each new day, my kids are absorbing and using new English words. Having three children means that I can see how they adapt to the two languages in their own personal way. On one hand, returning to Ireland for a visit is always a litmus test for my children to see how well their minority language is progressing. On the other hand, it enables me to see how well I’m doing as a mentor for their bilingual journey. As we live quite near the sea in France, traveling by ferry back to Ireland is a convenient way to make the trip. It always feels like we’re embarking on a long voyage and switching back to a full English-speaking environment begins right from the moment we board the ship. When we leave the port of Cherbourg, my oldest daughter never fails to highlight that the Titanic left this very port for Ireland over 100 years ago, as she points over to the old ferry port which now houses a remarkable maritime museum. 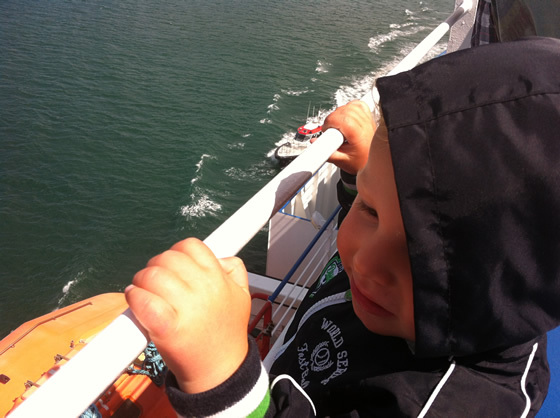 At the same time my two-year-old son leaps with excitement outside on the top deck. I always have to reassure them, though, that not every large boat suffers the same fate as the Titanic! Driving on the left side of the road; signs posted not only in English but also in Irish; tractors that share the main roads but graciously move to the hard shoulder to give way to traffic—all these make up the uniquely Irish experience of a journey on coastal roads and are becoming more familiar to my kids each time we return. When we arrive in Dublin, we’re greeted by my family and my children don’t seem to be bewildered or daunted by all the English that suddenly engulfs them! It takes just seconds for my two girls to start making rubber band bracelets with their cousins, as they discover that this trend is as popular here as it is back in France. It’s as if the kids take up right where they left off the last time they saw each other seven months ago. 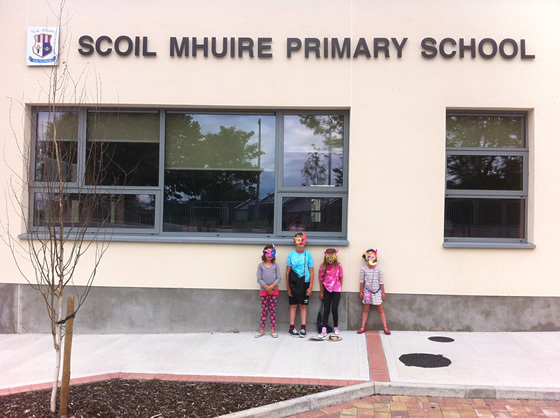 As it happened, we arrived in a week where their youngest cousins were taking part in summer school activities. You can only imagine how surprised and excited my two daughters were when the teachers allowed them to join in. So the week continued with their mornings spent face painting, baking cupcakes, decorating masks, all kinds of things that my children just love to do…but this time within the context of using English in a classroom. I was proud of my girls for throwing themselves in at the deep end. They spoke freely with others and even made some new friends in a new environment where they had to be independent. We then spent the afternoons together as a family, going sightseeing. 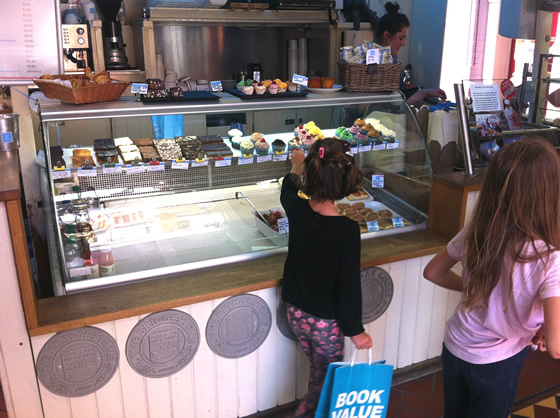 It’s great fun being a tourist in the town where you grew up—even better when you’re showing your own kids the places you knew so well when you were their age! 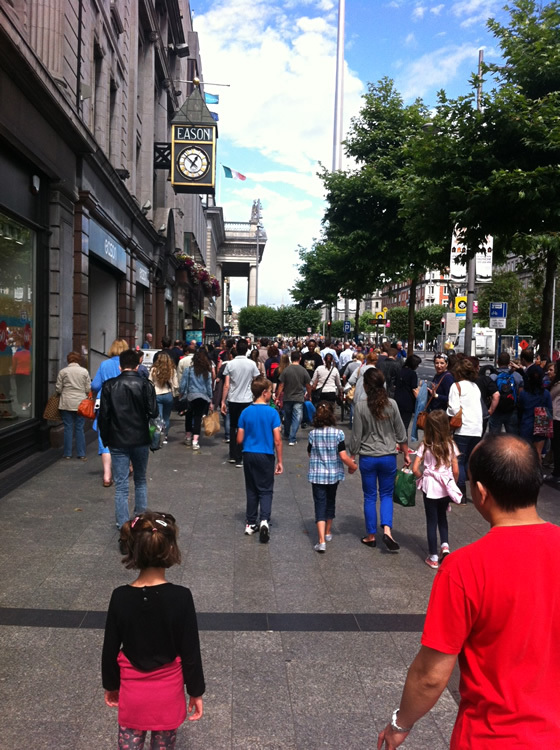 Although Dublin’s main thoroughfare, O’Connell Street, has changed so much over the years, the soul of the place remains the same: it bustles with people, doubledecker buses, and the occasional Shane McGowan look-alike busker singing old Irish ballads, like a scene from a James Joyce novel. I kind of felt like an unofficial tourist guide as I explained the history of some of the city landmarks—all I was missing was an umbrella to raise in the air so I wouldn’t lose my little group of tourists! 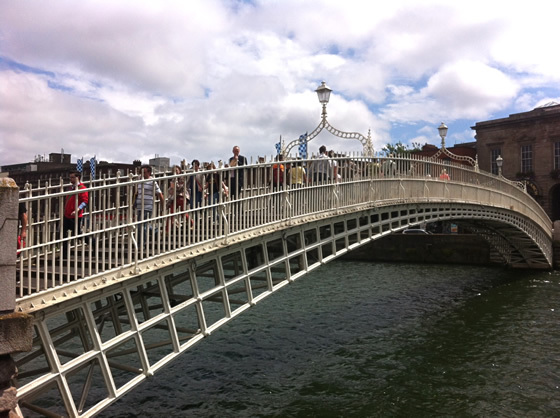 My kids particularly liked crossing the old Ha’penny cast iron footbridge, where right up to the First World War pedestrians had to pay a toll (a half penny) to cross the bridge over the River Liffey that links north and south Dublin. We also passed through the cobbled stone Temple Bar, Dublin’s gastronomic and pub hotspot (no sampling for the children, rest assured), and across to Ireland’s oldest market, George’s Street Arcade, where my second daughter marveled in the colors of the cupcakes behind the glass counter, naming all the colors in English to her older cousin. The girls were really playing their part in the shops, pointing out how different certain things are back in France. My oldest daughter, who loves to read, took particular pleasure in reading the quirky signs popping up around the place. I have to admit, though, that it took a little time to explain to her the meanings of some of them, like the sign we came across here! The Irish sense of humor at its finest! Passing down your native language to your children is just one stepping-stone to a wealth of elements that make up a culture. From an Irish perspective, music is also an important gateway to the history and way of life of the Irish and Ireland. 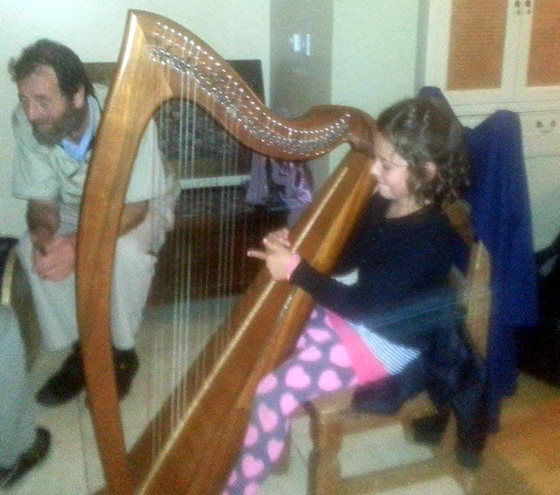 This really hit home to my daughter when she experienced the sound of a harp for the first time, played by her cousin at a family party. She couldn’t hold herself back from asking a lot of questions before finally giving it a try herself. Music is an important gateway to culture. It just made sense for my kids to see all of this for themselves, to interact, to ask questions, and to experience the many things that children around the world do, but with subtle differences that vary from region to region, country to country. In our case, the richness of both the Irish and French cultures will be what makes up our kids, and this will help break down barriers so they can be more culturally aware and are rarely lost in translation. From a personal point of view, the road so far to raising my children bilingually has sometimes been winding, with a few bumps along the way that are just as much a learning curve for me as they are for my kids. Tenacity, tension, and timing do play their role; I guess you just have to manage each one as best you can. I can safely say, though, that were it not for the tenacious encouragement of my wife and the support of my loving family back in Ireland, this would be much tougher! And thanks to the wonderful work of Bilingual Monkeys, I now know that a large community of bilingual families is out there in the world and that I can avail myself of some really useful tips shared by Adam and by all of you. How about you? Please share your impressions of this post with Peter! Loved your website and post. I’ve never seen anything like this. What a great opportunity for children. 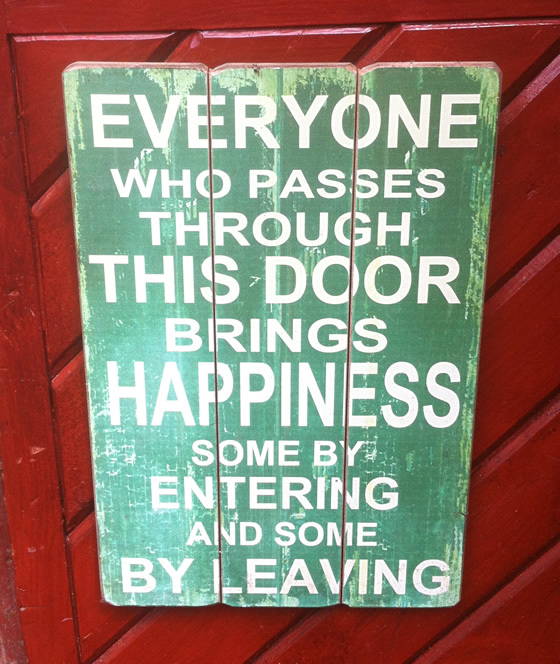 Thanks Brighid, you will find other new helpful articles posted on this blog quite regularly. Here’s something important that all mums can use to help their kids. Lovely article, Peter. I am absolutely in love with Ireland. I worked there a few summers and also visited to show my family and friends, as you say, as an unofficial but passionate tour guide. Both my husband and I are Spanish, but we try to teach our 2-year-old son some English. We cannot make him a bilingual monkey, but we will try he reaches some fluency! Thank you so much for you kind comments, I’m glad you enjoyed the article. I personally believe that your efforts to introduce your son to a little English will benefit him in years to come, so do keep it up. You will find other interesting and useful articles on Bilingual Monkeys, like I do, to get some great ideas. Best wishes to you and your family in beautiful Spain!